This page was stale. It has officially been made unstale now. You’re viewing version 2.001. Aren’t you lucky? I’m Colin. 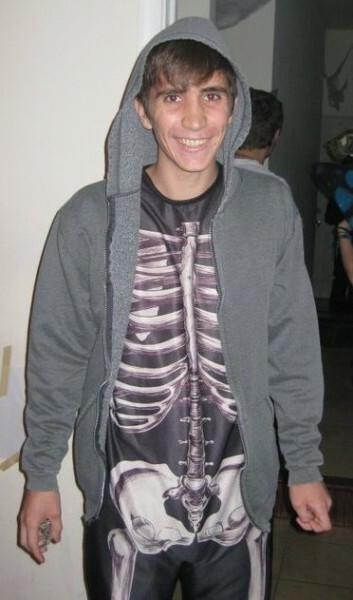 This is me dressed as Donnie Darko for Halloween. If you look closely you can see my shot glass clutched in my right hand. Halloween parties are very fun. I like t-shirts and blog about them often. I like to use commas to make long sentences. Sometimes I splice them–I apologize if you love grammar. No one has ever accused me of being too wordy. I talk quietly (most of the time). I’m a junior in college at Temple U.
I travel whenever I can. Countries I’ve been to include: England, Ireland, France, Netherlands, Germany, Czech Republic. I will hopefully be adding many more to that. I love music. I also love festivals. I’ve so far been to Bonnaroo, Lollapalooza, and Virgin Fest. I will hopefully be adding to that as well. I have a last.fm account to find new music. Be my friend and check out my awesome taste! I don’t actually wear graphic tees that often anymore (maybe I shouldn’t admit that).